Each pack in Route 11's range has a different color, but few relate to the flavor. This one does but the background design is a little overly fussy. As are the oval shaped bubbles with key info within. The big and bold Route 11 logo is however very good. There is no need for it to dominate the bag - it isn't as important as the flavor. But when you are building a brand it is wise to make the most of what you have. Although these felt a little greasy, they were not nearly as hard and brittle as some Chips of this nature. It doesn't say they were Kettle Cooked, but the crunch suggested they were. They were robust and firm to the bite. These Chips were interestingly light in color. There was some skin visible, but there wasn't much in the way of hubbly oil bubblies. There was plenty of seasoning, but it was light in color - we thought there would be sprinklings of large Dill weed flecks. Most interestingly, there were bendy, curly and wriggly shapes throughout. It seems somewhat odd that the Barbeque flavor should include three times the sodium of this falvor; you would have thought Chips manufacturers would look out for this sort of thing and make sure it doesn't happen. 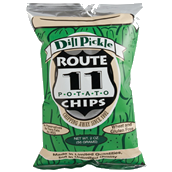 Anyway, back to this flavor - yep, Dill Pickle. It is hard to imagine any Chips getting as close as McClure's, who are specialists in this flavor, but these had a mild vinegary, almost sweet pickle kick, which was very pleasant.